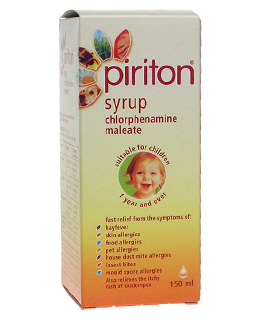 Piriton Syrup is an antihistamine drug used to treat nasal allergies, particularly seasonal allergic rhinitis (hay fever). The drug helps control the symptoms of histamine release - sneezing, runny nose and nasal itching; it is less effective for treating nasal congestion. Children aged 1-2 years: 1 x 2.5 ml. Maximum daily dose: 2 x 2.5 ml spoonfuls in 24 hours. Children aged 2-6 years: 1 x 2.5 ml every 4-6 hours. Maximum daily dose: 6 x 2.5 ml spoonfuls in 24 hours. Children aged 6-12 years: 1 x 5 ml every 4-6 hours. Maximum daily dose: 6 x 5 ml spoonfuls in 24 hours. Adults and children aged over 12: 2 x 5 ml every 4-6 hours. Maximum daily dose: 12 x 5 ml spoonfuls in 24 hours. Children under 12 months: Not recommended. 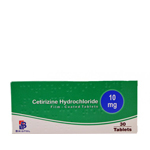 Piriton Allergy contains Chlorphenamine Maleate. For more information about the dosage and side-effects of Piriton Allergy, click here to view the Patient Information Leaflet from the Electronic Medicines Compendium.